Jupon offers four collections of bridal gloves that include around 50 different models in a variety of fabric qualities and colours. There is a glove for every wedding gown and taste. Exclusive fabrics and unique designs make it possible to give each creation a unique, individual touch. Jupon brings you these stunning bridal gloves. They feature lace flowers and are finished off wonderfully with a splashing of pearls. Available in Ivory. ..
A stunning pair of bridal gloves from Jupon. These gloves are made from high quality netting which is see through, adding a little bit extra to the bride's look. Available in Ivory. ..
Jupon brings you these bridal gloves in the Manchet Cuff style. They feature a luxury decoration across the entire cuff giving it the perfect finish. Available in Ivory. ..
Jupon brings you these bridal gloves in the Manchet Cuff style. They feature a luxury decoration of ivory coloured pearls across the entire cuff giving it the perfect finish. Available in Ivory. ..
Jupon brings you this lovely floral ornament. The large flower sits perfectly on the brides upper arm and it's both comfortable and stylish. Available in Ivory and Ivory / Peach. ..
Jupon bridal cuff with an application made of strass stones and lovely sequins. Fastener: Pearl Buttons. Available in Ivory. 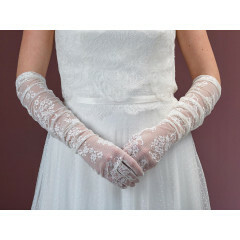 ..
Fingerless lace bridal gloves from Jupon range of hand accessories and bridal gloves. Fastener: Pink Ribbon. Available in Ivory. ..
A Jupon bridal wristand with a bow. This bridal glove is made of fine lace. Fastener: Pearl Button. Available in Ivory. ..
A wristband style bridal glove with a corsage of flowers, strass stones, pearls and a fine french lace finish. Fastener: Pearl Buttons. Available in Ivory. ..
A lovely lace wristband from Jupon. This bridal glove is complete with an Organza flower and feather finish. Fastener: Pearl Buttons. Available in Ivory. ..
Jupon brings you this lovely, lace, bridal wristband complete with a voile and lace flower and strass stone adornments. ..
A stunning lace wristband from the Jupon bridal glove range. This wristband comes complete with a voile flower and a feather finish. Available in Ivory. .. Luxury lace cuffs from Jupon, featuring pearls and sequins, finished off with some beautiful Strass Stones. Available in Ivory. .. Bridal Gloves from the Satin Collection. What makes this collection unique is its elegant satin sheen, perfect fit and wide range of colours. These gloves are short. Available in White, Ivory, Champain, Pink, Red, Bor.. Bridal Gloves from the Satin Collection. What makes this collection unique is its elegant satin sheen, perfect fit and wide range of colours. These gloves are Half-long. Available in White, Ivory, Champaign, Pink, Red.. Bridal Gloves from the Satin Collection. What makes this collection unique is its elegant satin sheen, perfect fit and wide range of colours. These gloves are long. Available in White, Ivory, Champaign, Pink, Red, Bor..